Worn once in great condition no dings. leather stitched bottoms. great shoes. Style: Leather Wood Wedge. Dark Brown Wedge: 4.5". Light Brown Wedge: 5". Features: Both Shoes are Buckle Closure. Strappy Straw Wedge. Color: Brown. 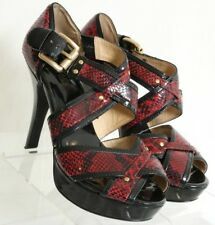 "Michael" Michael Kors Bordeaux Leather Mary Jane Platform Slim Heels Size 7 1/2. Condition is Pre-owned. Shipped with USPS Priority Mail. 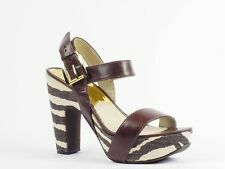 Michael Kors Women's Size 7 Leather Glass Heels Open Toe Brown. Condition is Pre-owned. Shipped with USPS Priority Mail. These shoes are adorable & in excellent condition. Excellent, new condition. See pictures for detail. The perfect pair of heels! Comfortable and stylish! Brown crisscross detail at top of shoe, rope detail on wedge and gold buckle closure at ankles. MATERIAL: LEATHER. Make Supersized Seem Small. LENGTH: 9 1/2". Get Images that. Slingback strap with goring at the heel, leather lining. Rubber sole. Rear zipper. Three adjustable buckles. MATERIAL: PATENT LEATHER. Get Supersized Images & Free Image Hosting. LENGTH: 9". **please see pics for the most detailed description*** check out our store! we hand select and inspect each of our items. we stock new to gently used quality clothing, shoes, & accessories & we consider all reasonable offers. we offer combined shipping discounts so if purchasing multiple items, please ask for an updated invoice. ⦁	paypal only ⦁	global shipping - buyer responsible for any additional shipping charges ⦁	items shipped within 24 hours of payment ⦁	30 day refund after items are returned in original condition less shipping fee * GA residents must include 7% sales tax please feel free to contact us with any questions. thanks! Strappy Platform Stiletto Heel Sandals. Color: Silver Glitter. 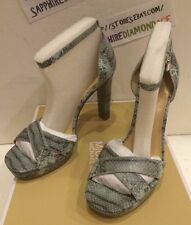 Size: 7.5 M.
Michael KorsAngeline Platform Wedge Sandal w/ Wooden Heel - Sz 7.5 / 38 - New! Wooden heels stand up to wear much longer than any of my MK jute-wrapped, espadrille style sandals. Also, wood is much easier to clean, so these sandals always look nice. These round-toe, t-strap platform wedge sandals have an adjustable roller buckle closure at the ankle. Material : Suede Upper, Rubber sole. Color : Dark Brown. The sandals have platforms and buckle closure around the base of the ankle. ( SEE photos). Glossy patent leather and wrapped ankle straps elevate our Niki sandals with luxe appeal. The cone heel is highlighted by mirror-metallic accents for lustrous shine. Finished with a leather sole and buckle fastening, this architectural style is the perfect complement to the season’s embellished dresses. DETAILS • 100% Coated Calf Leather • Sole: Leather • Buckle Fastening • Heel Height: 4" • Heel Type: Galvanized • Imported •Shipped with USPS Priority Mail. Pair them with a full skirt and tonal crop top for a perfectly polished spring look.Heel Height: 5"• Platform: 1.5"• Wedge Heel• Leather Sole• Open Toe• Buckle. Gorgeously crafted from genuine snakeskin and finished with a luxe braided chain strap.